Massage gift certificate of Ala Relaxation Okinawa hot stone massage. In this therapeutic and deeply relaxing massage heated basalt stones are placed on the body’s chakra or key energy zones and used to massage the muscles. 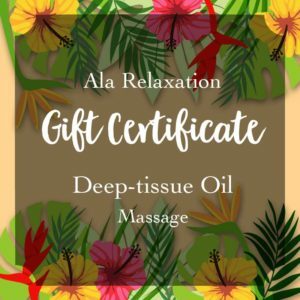 This effective technique softens muscle tissue relives tension in the body, and increases blood and lymph circulation.